Pakistani teenager Malala Yousafzai, who was shot and injured by the Taliban for advocating girls’ education, was awarded the International Children’s Peace Prize 2013 during a ceremony in the Hall of Knights in The Hague, Netherlands, Friday Sept. 6, 2013. 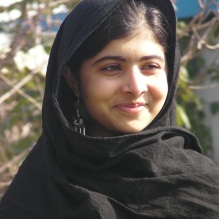 The 16-year-old continues to promote education for girls in her homeland. She accepted it “on behalf of all the children all over the world who are trying to go to school. Malala also received the prize by Yemeni Nobel Peace Prize laureate Tawakkol Karman. A Paquistanês adolescente Malala Yousafzai, que foi baleado e ferida por Talibans por defender a educação de meninas, recebeu o Prêmio ‘Internacional da Paz da Criança’ de 2013 durante uma cerimônia no Hall of Knights, em Haia, Holanda, sexta-feira 06 de setembro de 2013. A adolescente de 16 anos continua a promover a educação para meninas em sua terra natal. Ela aceitou o prêmio “em nome de todas as crianças de todo o mundo que estão tentando ir para a escola. Malala também recebeu o Prêmio Nobel da Paz Tawakkol Karman. Vida longa para Malala! E com muitos livros e sala de aula e professores e consciência crítica! Para ela e todas as meninas e meninos desse nosso mundo! ← Si, hay que soñar. siempre. Sim, tem que sonhar. sempre. Yes, we have to dream. always.